Have you shot a horror short lately? Have an idea for a horror short and you think you can finish it by August 22nd? Well, why not enter it in Dr. Gangrene's Heebie Jeebies Horror Short Film Fest? If you're interested, check out this press release that we found in our inbox! Dr. Gangrene and Culture Cringe Give You The Heebee Jeebees. 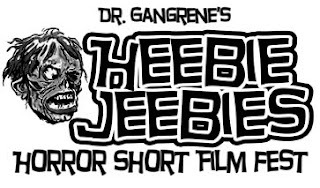 Murfreesboro, TN (07.24.2012) Nashville horror host Dr. Gangrene is teaming with Culture Cringe for the First Annual Heebie Jeebies Horror Short Film Festival. The one night event will showcase horror short films made locally in the middle Tennessee area as well as around the globe. Films will be screened September 29th 2012 at 3 Brothers Deli and Brewhouse located in the heart of Murfreesboro Tennesee, followed by an Award Scaremony honoring the best of the festival. Awards will be given for Best Director, Actor, Actress, Funniest Short, Scariest Short, Best Music Video, a best young film maker award and the Grand Prize of the festival will presented with the coveted Cringie Statue. Winners will also be included on a dvd release from Shackle Island Studios and Culture Cringe and aired on THE CW on Dr. Gangrene Presents television program. Cameron McCasland is an Emmy nominated film maker from Edgewood Texas who has called Nashville home since 2001. His work has been seen on MTV, CMT, The CW, and film festivals around the globe. His upcoming feature film “The Lashman” is due out later this year. If you're looking to finance a film or a project and you don't know about Kickstarter, you need to get your head in the game. By no means does putting together an awesome Kickstarter campaign mean you're going to be successful, but we're in a world where financing doesn't come easy and it's definitely worth a shot. Not only that, there's lots of success stories coming out the Kickstarter world these days, but, to get there, they all need help getting attention. So, I'd like to bring your attention to an awesome looking Kickstarter project called "The Undertakers". We spoke with Kevin Head about the project and, you know what to do - support indie film, go over to their Kickstarter page and donate a few bucks! There are certain places throughout the world that possess supernatural properties, where the dead inexplicably rise from the grave to hunt human flesh. Charged with defending this dangerous secret are a group of highly skilled agents in a private organization referred to as "The Undertakers". Their mission: to identify, segregate, and stand vigil in these dangerous areas preventing the possibility of a catastrophic outbreak. The Undertakers will be set in a highly stylised world with dark-gothic elements. Our character and zombie designs are created with a Burtonesque feel, giving the film a touch of similarity to classics like Cemetery Man and Underworld. But the emphasis is on story. The web series centers around the sacrifices these brave men and women make in order to protect the world each and every day, in total secrecy. Oh, and let's not forget to mention the kickass zombie killing scenes in which our characters prefer the traditional weapons of old, so that they might kill silently and swiftly. If you don’t mind us asking, what was the budget and how are you going to secure financing? At the moment, we are producing a series of web shorts that will lead up to the storyline of the feature film. We have decided to take the unconventional approach of crowd funding (Kickstarter.com) for raising the budget for these shorts for multiple reasons. It allows us to connect with fans of the genre directly, and give once-in-a-lifetime type rewards for their participation in raising the funds. Those who participate can receive cool items like an "I heart zombies" T-shirt, replica LARP swords and signed posters. They can also receive exciting rewards like Skyping with Richard Hatch (Battlestar Galactica), Producer credits and even a chance to appear as a zombie in the series. We are working to fund two separate groups of web shorts. The first has a budget of $28,000 and the second will be produced if we reach the goal of $55,000. We are producing these web shorts for a couple of reasons. First, we want to give fans a taste of what the world of The Undertakers feels like. We have been producing artwork, short stories and screenplays for a couple of years now and have a growing fan base that has sprung from our exposure on MySpace and Facebook. This is mainly for them. But, it also allows us to have something to show as we go looking for funding from production companies and investors for the eventual feature film The Undertakers: Road's End. As of now we have no plans to enter the shorts into any festivals. It is mainly for use on our website and will be distributed on dvd to those participating in the kickstarter campaign. Hopefully, these little gems will become a little part of our success story, and coveted by those who have them. 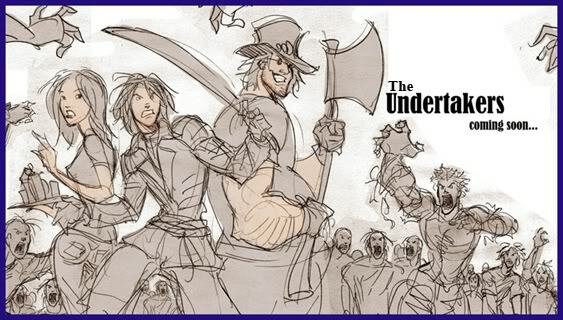 You can find out more about The Undertakers by visiting our Kickstarter page: http://kck.st/KAoAmv, by "liking" us on Facebook to follow our progress: https://www.facebook.com/TheUndertakersinfo, or by visiting our official website: www.theundertakers.info. You can only receive a DVD by making a small pledge on our Kickstarter page. I've been a fan of the genre since watching the late-night double-feature of Night of the Living Dead and The Children at age 8 on Detroit television. I obtained a degree in Television Production at Ferris State University and became a post-production specialist, trained in editing, animating and camera. About six years ago, I decided to follow my heart and pursue a career as a writer/director in feature film. My writing has garnered recent recognition, as I have been covered by William Morris Endeavor on the recommendation of Darren Lynn Bousman (Director of several films in the Saw franchise), hired by Zeitgeist Productions to pen a horror film now in development, and cultivated several invaluable relationships with recognizable actors with the desire to work on several of my projects. I have several other projects in the works, but this is the one closest to my heart. Indie horror is in a very interesting place right now. With the collapse of our economy a few years back, production companies were forced to adapt. The result for Indie writers, producers and directors were fewer options and sales. The amazing thing for me is how filmmakers always seem to find a way. From the ashes of our economic despair comes a new platform like Kickstarter.com, which allows fans to decide what gets made and what doesn't. It's a frustrating, yet exciting time for those of us working our asses off trying to get our films made. Adapt or abandon your dreams. There are a few other things in the works at the moment. As we adapt, learn and get efficient at what we are doing, others look to use that knowledge which has led me to the producing side. I'm planning to be associated with a few other web projects in the near future. We are also gearing up to fund another film I have in preproduction entitled "Black Storm", which centers around a small community plagued by a group of malevolent entities trapped inside a massive dust storm. Next January sees the start of a brand new Horror Film Festival based in the seaside resort of Southend-on-Sea, Essex. England. The Horror-on-Sea Film Festival will be screening a mix of Horror Films from the UK and the rest of the world. We are now accepting feature length submissions on DVD until the 30th September and admission is free. There is also a faux trailer competition. Please go to www.horror-on-sea.com or email horror@thewhitebus.org.uk for further details. "The Meat Puppet" - Filming in New Jersey right now! New project filming in New Jersey right now, check it out. Always good to keep up on what's going on out there. How about you? Are you filming something? Want to promote your project? Let us know! "THE MEAT PUPPET" (1. meat puppet; (noun) person(s) that have no will of their own; somebody that lets others control them. Another name for a human being, especially one who doesn't think for him/herself, has no soul and is therefore controlled by others). 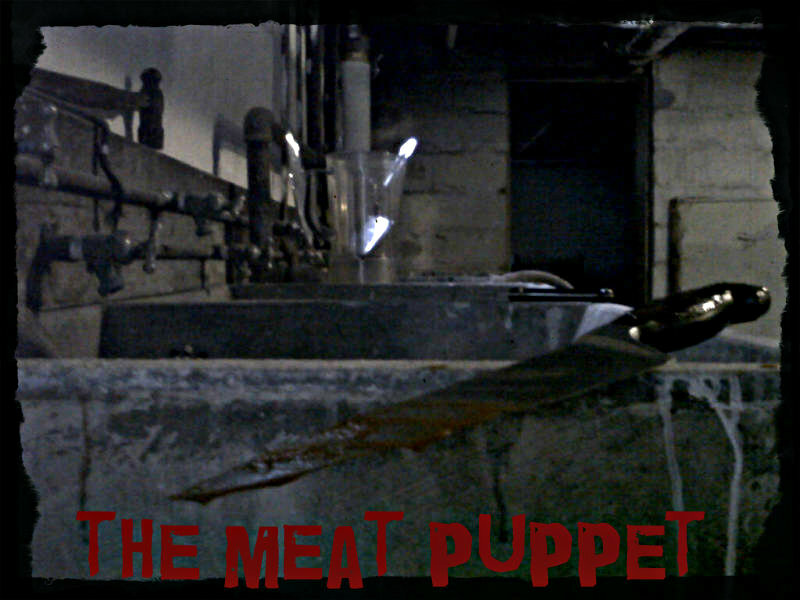 "Currently filming in New Jersey is this year’s new bone chilling horror/thriller “The Meat Puppet”. From the mind of Award Winning Actor Keith Collins, along with Silver Phoenix Entertainment, Valenti Vision Films and the pen of NY Emmy Award Winning writer Joseph Pepitone and Billy Pepitone (“Stuck in the Middle”) comes a sadistic thrill fest, full of twists and turns, that is sure to give movie goers the fright of their lives. Directed by Joe Valenti (“Echelon 8”). Produced by Keith Collins. Produced & Executive Produced by Blaze Kelly Coyle and Joe Valenti. Written by Joseph & Billy Pepitone. With a well-rounded cast including many special appearances and STARRING: Gregg Valentino (TLC’s “The Man Whose Arms Exploded”), Billy Sample (“Former NY Yankee”), Brandon Ruckdashel (“Co-ed Confidential”), Geri Reischl (“Gunsmoke”,“The Brady Bunch Variety Hour” aka Fake Jan), Jason Prager (“Beauty and the Geek”), Billy Garcia (“Survivor”), Gary Garver (“formerly from the Howard Stern Show”), Ron “Bumblefoot” Thal (“Guns N Roses”), Erick Chopin (Winner of NBC’s “The Biggest Loser”), Keith Collins (“Stuck in the Middle”, “BIdentity Crisis”), Jamie Reed-Kovac (Fury – “American Gladiators”), April Hunter (“WCW”, ”TNA”), Doug Bollinger (“Waltzing Anna”, “Mail Order Bride”),Theresa Galeani (“Cross the Line”, “I am Legend”), John Fields (“A-List DJ Unique”), Anastasia Smith (“NY Majesty Lingerie Football League”) and Faith Stanek (“Star Trek Phase 2 Web Series”). Yup, it's been a while since we last posted anything... but, I'm ready to get things back on track. What can I say? I want to get in touch with more horror screenwriters, filmmakers and festival folks. I want to give more indie horror projects promotion and help get stuff out there. I have to keep posting because we have to elevate this little sub-genre! There's a million ways to produce a film, but let's simplify this a bit - on one side, you have the equity financing model and on the other side, you have the debt financing model. Equity financing means you have the equity - long and short, you've got the money and you're funding it yourself. If that's your model, have at it. You can write, direct and produce your project any way you'd like. Debt financing, on the other hand, means that someone is willing to pay for the final product and you then get someone to lend you money against that promise to pay, so you can go and produce your film. Most indie films are, at least in part, financed this way. Yes, there's lots in between and that's a very simplistic view, but I'm making a point here, okay? Now, how much this person is willing to pay for this unmade project depends on how you've packaged it up. There's three major components: talent, script and director. The big thing is talent... who are the actors? If you're a friend of Brad Pitt's and he's willing to attach himself, boom... you're good to go. Don't worry about the script. However, most of us need to convince talent to come on board and we need to convince people that this is a good project. So, that leaves the writer and director. I'm going to concentrate on the writer here, as I feel the script is the true foundation of any project, but this is just as pertinent to the director. You need a good script, where do you get it? A script by a produced and/or working screenwriter is one thing, they have proven that they can write material that works. I'm not talking about your micro-budget film that you produced and financed yourself, either. I'm talking about a script from a working Hollywood screenwriter. Get a script from one of them, you've got a good base. However, getting a script from a well known or produced writer can be tough, especially if you're an unproven producer, so you might have to go a little further down the trough... or you might want to use your own material. If that's the case, you need something that makes that script stand out, something that says, "this is worth taking a chance on". So, what separates you from the rest of the pile of unproduced and non-working screenwriters? See where I'm going with this, yet? It's awards and accolades. Where do you get those? From winning film festivals and screenwriting competitions. I've read bio's on writers that say things like, "quarter finalist in such and such" or "top 20% in this and that"... and that makes the bio on the writer far more compelling than, "I think I'm a pretty good writer", which is what you're saying if you're unproduced, unpaid and haven't won any awards. 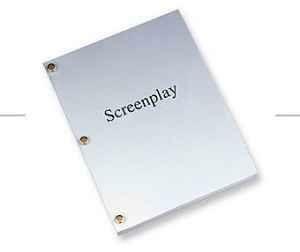 Don't kid yourself, most people won't read the script. They'll read your bio, the logline and, if you're lucky, your outline. You want to separate yourself from the pack? These awards and accolades make a big difference. So, do yourself a favor, enter the festivals and competitions. Even if you're just producing and financing your own film - it helps sell it once it's done. Also, on the writing side, if there's an option to get coverage, take it. It costs you a bit extra, but you can learn where you can improve and you can learn what these guys want. Then, you'll know what you need to do when you enter the next festival to get some accolades. Once you have accolades, you're on your way to being a produced and working writer and/or director. What do you think? Got a different opinion? Let me know!